Culture Power 45 is quickly solidifying itself as a staple in the limited vinyl release arena. 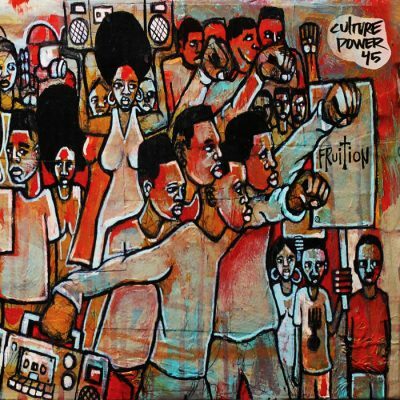 Manifested from the thought that black artists could come together and succeed collectively through self investment, Culture Power 45 since its first limited/collectible 45 release in December 2016 has consistently sold out of it releases. Monthly the collective has released their color coded limited edition lathe cut 45’s from Infinito 2017, Thaione Davis, Max Ptah feat. Blueprint, Radius, and Rashid Hadee to name a few. Due to a high demand Culture Power 45 decided to put together a compilation that showcases the artists associated with the collective. That high demand along with financial efforts from each artist gave birth to the 7th CP45 release ‘Fruition’. Fruition serves as a platform for showcasing the artists associated with Culture Power 45, the title lends itself to the experience of the collective as each song is a piece of the whole which manifested the project. Artists working together professionally, creatively, and financially to bear fruit is what Fruition is all about. The Fruition intro is a snippet of an actual phone conference held monthly and sets the listener up for a journey via precise lyrics and tight beats. Take for instance the Tall Black Guy produced News Flash Pt. 2 from 80’s Babies with Dee Jackson featuring Chicago mainstay Thaione Davis where the two pose as modern day news anchors alerting the listener to the constant ills of a residing in a violence driven politically oppressed environment. Staying true to the Culture Power 45 mission, Fruition is only available on vinyl. comment "VA – Culture Power 45: Fruition (Vinyl) (2017) (FLAC + 320 kbps)"